Despite the eroding influence of some aspects of post-modern thinking, most of you reading this will agree with me when I declare the Bible to be divinely inspired and authoritative. However, we may well differ in how we interpret the inspired written Word of God. I am currently reading a book entitled ‘Debating Calvinism’. I do not think it is a particularly helpful book but it does highlight the vastly different ways that ostensibly intelligent and genuine Christians can understand the scriptures. Both men featured in ‘Debating Calvinism’ believe in the inspiration and authority of the Bible. In some instances, both cite the very same texts, yet come to very different conclusions. Of course, it is all Herman’s fault. Herman? Yes, Hermeneutics. Strictly speaking, hermeneutics is the science and method of interpreting texts. As a ‘science’, it includes a set of generally accepted rules for interpreting scripture. The problem is, hermeneutics is more than a science, it is also an art. It is more than the mechanistic application of a set of rules. Skill is needed, and intuition, and Holy Spirit enlightenment. Sometimes, but not often, interpretation of a text hangs on the translation of a single word or phrase. The average Christian only has recourse to a few modern translations and perhaps a computerised Bible that includes Strong’s definitions of the underlying Hebrew and Greek words. However, most modern translations of the Bible are excellent and so it is not often that we need to dig into concordances and the like to determine the meaning of a particular word. For most believers, the challenge is not in the translation of the text, but in how to understand it. Here are three key interpretive principles. For most biblical texts, these are all you need to arrive at a sound interpretation. 1. Context: Most errors of interpretation come from lifting a text out of its context. The original authors of the biblical texts penned their work within a particular historical and cultural context. The question you need to ask is, ‘How would the first readers/listeners have understood this text?’ Ancient Jews would have a different frame of reference to their Greek contemporaries. Their traditions would differ as would their beliefs and mindsets. A gentile author, Luke for instance, would express things differently to, say, Paul the Jew. Similarly, a group of believers who had converted from Judaism would understand a letter written to them, Hebrews for instance, from a specifically Jewish perspective. However, the most important, and immediate, context is not the historical/cultural but the scriptural context. The questions here are, ‘What comes just before and after the text in question? In what larger thought, theme, or sub-theme, is the text imbedded. What is the author’s purpose in writing this particular text?’ Your interpretation of a text should, in almost all cases, be consistent with the meaning of the larger passage containing the text. 2. Exhaustive Reference: Ask the question, ‘What is the consistent and pervasive testimony of the entire Bible regarding the apparent meaning of any particular text?’ If you find that the meaning of a text seems to contradict what the rest of scripture declares, then you are looking at either a faulty interpretation or a genuine antinomy… another weird word. Antinomy means a contradiction resulting from two reasonable statements that contradict one another. The reasonable response, if you believe in the inspiration of scripture, is to accept both interpretations as true. However, if there is clear and substantial textual evidence of one interpretation, and just isolated or ambiguous evidence of the other, then you will be wise to give greater weight to the former. Much of the Calvinist debate I refer to at the start of this article is between the consistent evidence of many scriptures against the evidence of a few, apparently contradictory, references. 3. Christocentricity: Difficult texts are often much easier to understand when we start with the question, ‘What did Jesus say concerning this, or what did He do that sheds light on this?’ Go to the Gospels first to try to answer this question. From there, go to the Old Testament to understand better why Jesus said and did the things He did. Then go to the balance of the New Testament to understand more fully what He said and did and to receive instruction on how to apply His truth. This is what I call Christocentric Hermeneutics. 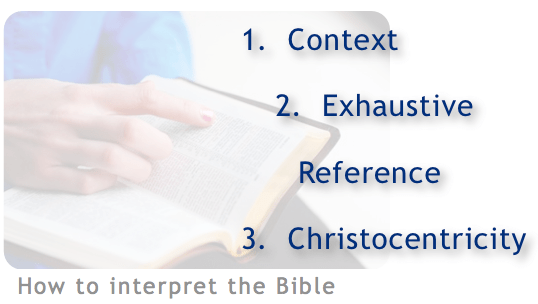 These then are the three key principles of biblical interpretation that I recommend. Applying these principles will inevitably lead you to the plain or superficial meaning of the text. Sometimes you hear scholars saying that the ‘literal’ interpretation of passage of scripture is the only ‘true’ interpretation. A well-known mantra is ‘to spiritualise is to tell spiritual lies’; Clever, but not always true. Down through the ages great men and women of God have discovered deeper levels of meaning within the sacred text. The standard principles of interpretation will not usually reveal these levels of meaning. We need to make room for ‘mystery’ in our thinking. We also need to make room for prophetic insights and reader-relevant understandings… but more on this in a future article.